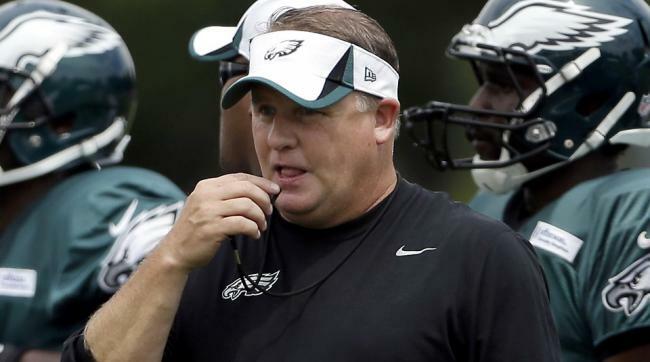 back-to-back 10 win seasons Chip Kelly was the toast in the city of brotherly love. Now, those same fans who once praised Kelly are sharpening their pitchforks to run the third year coach out of town. At 4-6 the Eagles are still in the NFC East, but after rookie quarterback Jameis Winston threw five touchdowns and Doug Martin ran for over 200 yards, the Eagles playoff chances are fading fast. This tension has been building in Philadelphia since Kelly took over football operations. In that time Kelly has let successful players such as Lesean McCoy, Desean Jackson, Nick Foles, and Jeremy Maclin go while bringing in players that made the Philly faithful scratch their heads. While Nick Foles played at a pro-bowl level, Kelly brought in the extremely fragile and unproved Sam Bradford who shockingly couldn’t make it through another NFL season. Desean Jackson (left) and Lesean McCoy (right) were shipped out of town and since their departure the Eagles offense hasn’t recovered. staler then a two week old cheesesteak. Chip’s confidence that his system was greater then the players has come back to haunt him as the Eagles have struggled to move the ball all season while his former players are making splashes in their new NFL homes. Fans have to wonder what kind of team the Eagles would be if those players still donned the green. So what now? It would shock me if the Eagles fired Chip Kelly especially one year into giving him complete control. However, I predict that Chip Kelly will leave Philly at the end of this season. Why? He’s always been an opportunist, and their are just too many great opportunities out there. Don’t believe me? Consider this. Chip Kelly was dying to get Marcus Mariota in this past draft and couldn’t pull off a deal. The Titans need a new coach and would probably give Chip full control if he became the coach. Also given the state of the AFC South, Kelly could see an easier road to the playoffs as well. look to win a National Championship. Possible jobs that could open include Texas and LSU while jobs that are already enticing include USC and the University of Miami. We know that Kelly can coach in college, and in recent years coaches like Saban and Harbaugh have thrived in their returns to the NCAA. Could the Eagles make the playoffs? Sure. Could Kelly return next season? Of course. Still the way this season has gone and how the team has appeared to quit on Kelly, or at least the defense in the game against Tampa Bay, all eyes will been on Philadelphia as the soap opera plays itself out. Once thing is for certain, it certainly isn’t sunny in Philadelphia right now. Previous NFL’s COLOR RUSH Needs to be Stopped!